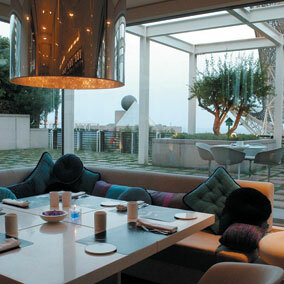 Local boy Sergi Arola�s two Michelin starred restaurant is situated in the luxury Hotel Arts in the Olympic village. Like his Madrid restaurant (La Broche)Arola�s aim is to give the pica-pica modern makeover. Pica-pica can be best translated as "nibbles." It's not tapas exactly, as tapas usually involve some form of labor-intensive preparation. Pica-pica on the other hand could be bite-sized pieces of Manchego cheese, Iberian ham, preserved shellfish, or high-end canned tuna. Thus your meal at Arola is likely to start with patatas bravas cut and arranged on plate to look like dozens of tiny female breasts, tinned cockles that meticulously fan out from a dainty bowl of piquant dressing, and perfect asparagus spears that lay languidly on a bed of romesco sauce. Sitting amidst a quirky, pop-art decor in purple and lime green Arola�s dining room is a place to relax and dine socially. A place where cuisine and ambience are taken seriously, even when the reason for your visit isn�t.